It’s a question I’ve been asked a few times recently – Why do you ride a fixie? Fixed gear bicycles (bikes without gears nor a freewheel – meaning you can’t stop pedalling) are very popular at the moment, but seem to be associated in some people’s minds with ‘hipsters’ and ‘wannabe couriers’. And whist it’s true there are some high-fashion low-practicality fixed gear bikes out there, there’s much more to riding one than fashion or trendsetting. 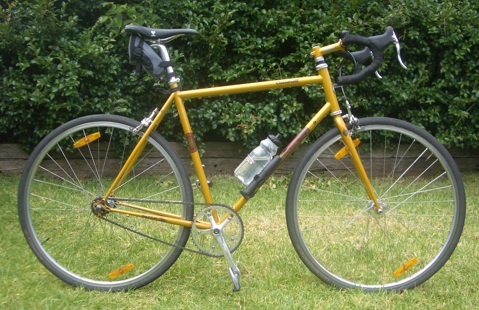 When the topic came up again recently on SydneyCyclist, I put together a few points about riding one. Actually more than a few points; I waxed lyrical at some length. Never being one to waste the opportunity to re-use old material, below is an edited version. It seems that it had some effect on the original questioner on SydneyCyclist – so perhaps it might persuade you to try out a fixie too! Fixies are FUN FUN FUN. Truly. You don’t know what you’re missing until you try it. You have no idea that your pedals have a ‘dead spot’ at the top and the bottom until you experience the smoothness of a fixed drivetrain. You have no idea as to how exhilarating and fast 35km/h can feel until you are spinning down a slope on a fixie. You have no idea how much better you can feel the amount of traction the rear wheel has until you ride with your legs coupled directly to the wheel. You have no idea how fast you can accelerate away from traffic lights until you ride with an optimised, super-efficient gear set-up. There is no reward in freewheeling down a hill, or clicking down through ever lower gears so you can crawl up a hill at a walking pace. You will only know this once you get comfortable on a fixie. Getting comfortable takes about two weeks. For the first week it feels very weird. I remember just stopping the bike was odd – you have to get used to taking your foot out of the pedal anywhere in the stroke. For the second week you are more relaxed, but keep forgetting to pedal. Nothing really bad happens, but the bike gives you a bit of a jolt to remind you to spin those legs! After a couple of weeks, though, it becomes second nature. It’s definitely worth riding singlespeed for a while first, to work out which gearing is going to suit you. If you jump straight on a fixie, you’ll think the gearing is too high because you are not comfortable putting in your normal effort. If you know that you can manage the gearing on a SS, though, it’s more clear that it’s just a familiarisation issue. (In fact, you can probably drop one size on the sprocket when you move to fixed, as it’s actually easier to climb hills on a fixie than on an equivalent freewheel. This is another magical fact you will discover when you get into it). What else to say? Fixies are FUN FUN FUN. Did I say that already? Gearing? I run 48×17, and love it. I’ve yet to find a hill in Sydney I couldn’t climb, but it’s high enough to cruise at a reasonable speed and cover good distances. Having said that, that’s probably on the higher side of average. Don’t make the mistake of going too low though. Using your lowest gearing from your normal ride will be too low – you’ll be spinning like mad and not getting anywhere. You’ll be surprised how you can climb those hills when you just have to get on with it, and don’t have the pernicious seduction of clicking down to a lower gear. Disc brakes? Sure, why not, although you’ll struggle finding a hub that can take one on the back and you’ll probably need to replace the stock forks (I don’t know of any frame / fork sets with rear drop-outs and front disc mountings). However, you’ll quickly find you rarely use your rear brake on a fixie – one benefit of feeling the traction so well is that you can deliver maximal braking to the front wheel – which is the most efficient way to stop the thing. I can perform a better emergency stop on my fixie than on my geared bikes. Anything else? Fixies are FUN FUN FUN. Did I say that already? Safety? Once you are used to them, I think fixies are actually safer to ride, too. Few reasons for this. 1) You go slower. You simply can’t built up that massive head of steam you get on a geared bike going downhill. You also have to take corners more slowly, to avoid pedal strike (an oft-worried about problem which in reality just doesn’t materialise. I’ve never had pedal strike on my fixie). However, you don’t sacrifice intensity nor adrenaline – you feel like you’re going fast, but without actually going as fast. 2) You can brake better. That ability to feel the back wheel starting to lose traction is real, and really helps tune your braking skills. It takes a while to get used to it (emergency braking whilst still pedalling will seem very strange to begin with), but it soon becomes second nature. Yes, there are some watch-outs – like not getting clothing caught in the chain, keeping everything tight so the chain can’t slip off etc which you need to be aware of, as if they happen are more problematic on a fixie than a regular bike. But in reality, I’ve never found them a problem. Oh, one more thing. Fixies are FUN FUN FUN. Did I say that already? In terms of pedals, you will need some sort of foot restraint – either clipless or cages. I DO NOT recommend using open platforms. Having your feet come off the pedals on a fixie is a very uncomfortable and even dangerous experience – it’s very hard to get your feet back on to a pedal that is churning round at high speed, and it could even crack into your shins with unpleasant consequences. In terms of the best system to use – use the one you are most familiar with. Getting your foot in and out of the pedal whilst the pedal is moving takes a bit of getting used to, and you don’t want to be fumbling with an unfamiliar pedal system at the same time. You will need brakes on a fixie you intend to ride on the road. (Yes, I know a few people manage without them, but you need to have exceptional control of the bike to compensate for the lack of brakes – and even then you will be unable to stop the bike as quickly as you can with a front brake). I have two regular brakes on my fixie, which is nice because it feels familiar, although as I said I rarely use the rear one. Stopping feels odd at first, because you are used to taking your feet off the pedals at a particular point. Normally, when you stop you cease pedalling just before you reach the point you want to actually stop, and coast with your feet in that position so you can unclip when you stop. This habit takes a little time to break, which means you either stop a metre or two before the point you intended (as that’s when the pedal is in the ‘right place’), or you go a bit too far forward. You’ll have a few uncomfortable moments when you almost do a very slow-speed rear-ending of a car or something, followed by a scramble to get your foot off the pedal in an unfamiliar position. It doesn’t take long to get used to unclipping at any point, however. I remember this quite clearly when I first went fixed – just stopping the thing at exactly the right spot seemed bizarrely hard. As a consequence I rode more cautiously for a while, whilst I got used to it – I was wary of having to do an unexpected stop. Now I’m used to it, i can’t really understand why I ever had a problem, as I can now pull up where I need to and do full-on emergency stops without thinking about it. Still, you will feel a bit more vulnerable in traffic to begin with. It’s not a major drama, and it only takes a few weeks to get comfortable. Think if it as an opportunity to empathise with less experienced cyclists on regular bikes setting out into traffic for the first time! One last thing – you’ll need to get used to spinning the back wheel round to get the pedal into the right position after you stop, ready to take off again. I do this by putting the front brake on, then pushing down and forward on the handlebars to lift the back wheel. You can then spin it (in either direction!) to get your lead foot into the right position. Again, as you get more comfortable you’ll be able to get going with the pedals in a less optimal position (especially on a downhill slope – hill starts are always a bit more interesting!). Oh yes, and fixies are FUN! This book had been on the shelf since Christmas, and although Mrs Chillikebab had read it, I hadn’t got around to it – until now. 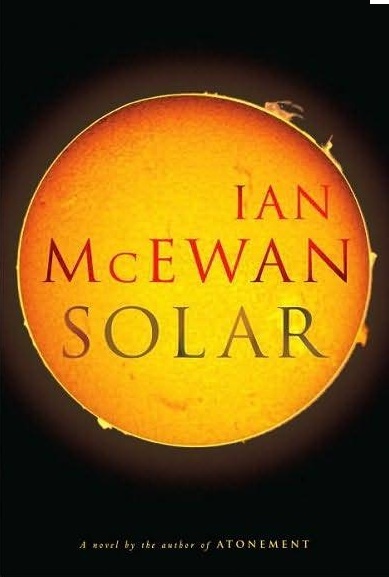 McEwan always makes for an interesting and entertaining read, and this book is no exception. It’s a very very dark (pretty much black) comedy that revolves around the central character, Michael Beard. He is a most unlikeable man – a solipsistic, obese philanderer who coasts through life on the glory of a Nobel Prize won as a young man. He ends up in charge of a government research institute investigating climate change, and along the way (thanks to the work of a brilliant young graduate) discovers a mechanism that will deliver cheap, workable solar energy. The science in the book is impeccable and adds authenticity to the novel, although to my mind does not dominate the story and is peripheral to the plot. Mrs Chillikebab disagreed, and thought the whole thing felt like a vehicle for McEwan to show off his research. Your mileage may vary. There are a few moments of real slapstick comedy, but for the most part the humour edges more towards ‘uncomfortable’ than ‘funny’. There are also a few weak points in the story; the extended section when beard goes to the Arctic feels overdone and interrupts the flow of the novel rather. These are minor gripes, however – I enjoyed the book. The ending is abrupt but satisfying (to me at least; other reviewers have felt a bit short-changed), and the intertwined threads of all the characters come together at the climax is worthy of an Ayckbourn play. I am currently in the San Francisco, and whilst I’ve unfortunately been too busy to do any cycling I have been impressed with the number of cyclists, and also the facilities for them. People so often say that Sydney is ‘too hilly, too spread out and too hot’ for cycling to be a mainstream form of travel. Well, as far as I can see SF is also all of those things – but there’s a lot of people riding. The mixture of riders in the city is also interesting; a real blend of hard-core road riders on sports bikes, lycra and helmets and more casual, elegantly dressed cyclists on upright bikes. The split is about 50:50 – whereas in Sydney I’d say it’s more 80:20. This being California, there are also a lot of hipster fixie riders. I wonder what gearing they use to get about, given all the steep hills. What impressed me most was the train, though. 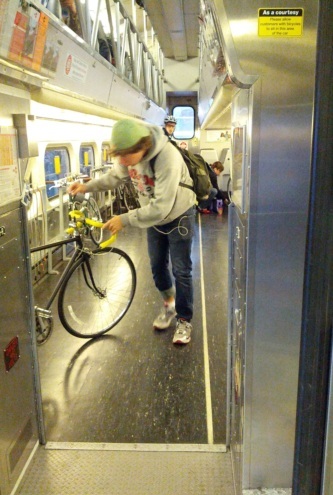 There is a whole carriage just for bikes, and each station on the line has bike facilities, lockers, covered bike racks and so on. Many of the buses serving the stations have bike racks on the front too. This is really multi-mode travel done well. If we had something like this on Sydney CityRail, I have no doubt it would be well used. But it seems O’Farrell would rather build more motorways instead. When will our politicians (Clover Moore excepted) wake up to what the rest of the world has already worked out? Providing for bicycles in urban environments is a cheap, efficient way to move people around. And it gets them fit and saves the environment too.